Today’s #TipTuesday post is around writing off small customer balances. Year-end is a great time to perform some clean-up tasks if it’s not something you do in your normal monthly or quarterly processes. This post will cover off the default Dynamics GP “Write Off Documents” process that makes this one very easy. 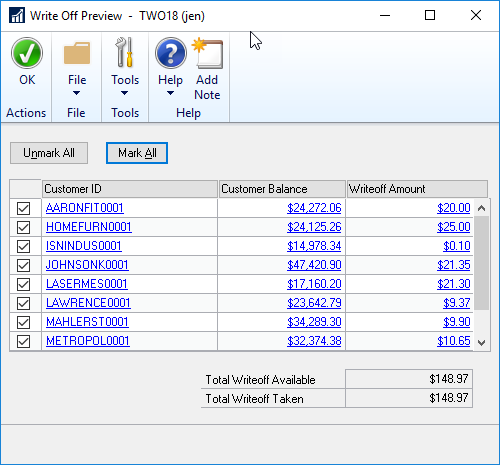 The Write Off Documents window is where you can write off outstanding positive or negative balances on a customer’s account. Specifically, a Writeoff Debit memo or Writeoff Credit memo will be automatically created and applied to the outstanding documents you have marked in the process. Why I recommend using this is it’s a controlled process, where fewer errors are likely to be made, as the system is filtering records based on configuration options (i.e. controlling what customers can have write-offs and up to what limit). Also, the system is crediting or debiting the customers that have unapplied balances meeting the criteria you ask for, which means fewer chances for typos on either the customer ID, the dollar amount, whether you are creating a manual Debit Note or Credit Note, remembering to apply it etc. A few things need to be enabled for this to happen, which requires review of some basic configuration. Go to the Sales navigation pane > Setup > Receivables > Options button. In this window, you will have options for Next Number settings on Writeoff Debit Notes and Writeoff Credit Notes. The default document numbering is awfully long and most clients want to edit the numbering pattern to make it shorter if nothing else. The customer itself must have a setting of Unlimited or appropriate Maximum Writeoff amount for this to work. 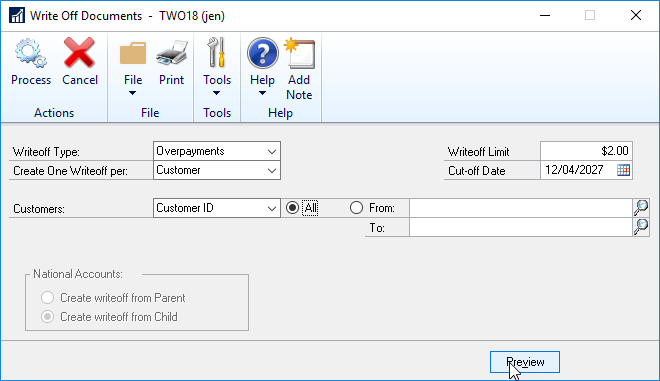 If your customer cards are set to Not Allowed, which is the default setting, those customers will not be visible in the Write Off Documents window. The setting on a customer is on the Sales navigation pane > Cards > Customer > Options button and your choices are to allow unlimited writeoffs or set a max dollar amount. The other alternative, if you are using Customer Classes, is to make the necessary change on a customer class and roll that down to customers in that class. That setting is on the Sales navigation pane > Setup > Customer Class > Options button. There must be Writeoffs and Overpayment Writeoffs accounts set for this to work, as the process is automatically creating transactions for you, where you don’t have the ability to enter a GL Account in the transaction before posting. You can have a different account for underpayment write-offs (i.e. bad debt expense) vs. overpayment write-offs if you choose to. There are a few options on where you can set this up, depending on how your GP company is configured. Go to the Sales navigation pane > Routines > Write Off Documents. You can choose to write-off either Underpayments or Overpayments, as well as whether you want to create one write-off per customer or per document. Example: if a customer has short-paid 2 invoices, do you to create 2 Writeoff Debit Notes, 1 per invoice, or 1 lump sum for both amounts? You need to specify a write-off dollar limit. Here I normally would suggest something small, if the intention is truly to write off tiny balances. Whatever your threshold is, $1.00, $5.00 or higher, type it in and it will only look for documents of that amount or smaller AND the customer’s Maximum Writeoff Amount must be higher than the amount to be written off. If you are searching for specific customers only, you can enter a range of customers by ID, Name, Class or User-Defined 1 field values. For Underpayments, you have a choice if you use National Accounts to create the writeoff from the Parent or the Child. Click on Preview, at the bottom of the window, to view what customers & documents have balances that fit your criteria. At this point, you can use any of the hyperlinks to drill back into more information on anything in the preview. Drilling in opens up different inquiry windows where you can verify the amounts as needed. Once you’re ready, you can mark or unmark records to finalize which customers will be affected. Whatever is marked will be processed. What the process is looking at is the unapplied amount of a document, not the customer’s balance, to determine if something meets the write off criteria. Once you close the preview window, you can click Process if you want to proceed. You will get a Discounts/Writeoff Journal printout etc. and the documents will be created, posted, and applied automatically. Whether these transactions are posted TO or THRU your General Ledger will depend on your Receivables Apply Doc. posting settings, which you can find on the Administration navigation pane > Setup > Posting > Posting (Series = Sales). If this is a new process for you, I highly recommend trying it in a test company first if you have one, especially if your default settings don’t align with settings that need to be changed. What is the best way to get a list of sales invoices that were written off? I need the invoices by date for an audit. Great question! My favourite way is to run a smartlist. I tested with the out of the box Receivables Transactions smartlist, search on the column “Write Off Amount” “is not equal to” and $0. It’s such a good question, I’m going to use this for tomorrow’s #TipTuesday column with more details if that isn’t enough to get you what you need! Thanks for the comment.